The March 2009 Daring Bakers challenge is hosted by Mary of Beans and Caviar, Melinda of Melbourne Larder and Enza of Io Da Grande. They have chosen Lasagne of Emilia-Romagna from The Splendid Table by Lynne Rossetto Kasper as the challenge. There are many kinds of lasagna and even in Italy every cook has his own recipe. But this is the real, traditional lasagna that is made in the Emilia-Romagna region of Italy, the birthplace of fresh egg pasta. It is made with homemade fresh spinach pasta, bechamel sauce and bolognese sauce. That's it. Each of these three components can be made at separate times, so there isn't so much to do all at once. You can certainly make the bolognese sauce a day before and the bechamel can even be made in the morning and allowed to cool. I like to grind my own meat because I know exactly what's in it if I grind it myself. And freshly ground meat is really, really nice to cook with. I have this meat grinder and I really like it. It's so worth doing. If you have a KitchenAid mixer, consider getting this meat grinder attachment. If you don't care for spinach, don't be put off by the spinach pasta. You can't really taste the spinach, but the spinach gives a great texture to the pasta that you will really like. Brian and I loved this lasagna - in fact, we thought it was the best lasagna we've ever eaten. Really. In a large heavy pot, brown the meats. Remove from the pot and set aside. If there is a lot of fat in the pot, drain but do not wipe clean. Add about a tablespoon of olive oil. Add all the vegetables (not the garlic) and saute these slowly for several minutes. Add the garlic and cook for one minute. Add the wine and cook for a couple of minutes and then add the tomato sauce and put the meat back in the pot. Add the broth and cook, uncovered, for one hour until the sauce is greatly reduced. Check for salt and add to taste. Cook until the liquid is reduced down but not completely evaporated. At this point you can let cool and refrigerate until you are ready to use. In a heavy saucepan melt the butter. Add the flour and cook, stirring with a whisk, for a couple of minutes. Add the milk slowly, whisking, until all the milk is added. Add the boullion cube and the grated nutmeg. Whisk and cook over medium heat for several minutes, until slightly thickened. Remove from heat and pour into a heatproof bowl or Pyrex cup. Let cool. Steam the spinach until just wilted. Cool a little and squeeze all the liquid out. Chop finely. Mound flour on work surface. Make a well in the center and break eggs into the well. Beat lightly with fork and add the spinach into the eggs. Mix with fork. Start incorporating the flour until all the flour is added. If still sticky, add more flour, little by little, until you have a dough that is not too dry and not too sticky. Knead by hand for 5 minutes. Wrap in well floured plastic wrap and set aside to rest at least for 30 minutes. Cut a section of dough and put through pasta maker rollers on widest setting. Fold in thirds, dust with more flour, and put through rollers again. Do this a few times and then adjust rollers to next number. Put pasta through the rollers, adding flour if you need to so it doesn't stick. Adjust rollers to next number and run pasta through until you run the pasta through setting #5 (this is the thinnest I make these noodles). Lay pasta out on well floured surface and cut to length of your pan. Bring a large pot of well salted water to boil and prepare a large bowl filled with ice water. Cook the lasagna noodles, only 2 or 3 at a time for just a minute or so. Take out with a large spider and place the pasta in the ice bath for a couple of minutes. Remove the pasta and place on a clean towel. Repeat until all the pasta is cooked. Place a thin layer of bechamel in your pan. Add a layer of pasta. Add layer of bechamel on the pasta and a layer of the bolognese sauce. Repeat until you have four layers of pasta. On the last layer of pasta, spread the last of the bechamel sauce and sprinkle some parmesan on top. Cover with foil* and bake at 350 degrees for 45 minutes. Remove foil and bake another 10 minutes until golden brown. Remove from oven and let sit for 15 minutes before slicing and serving. * Use Reynolds Wrap Nonstick foil for lasagna. If you don't know about this foil, it truly does not stick to foods like cheese, which makes it perfect for removing from lasagna. It's the only foil I buy now. La ringrazio molto. Sembra delizioso! Oh bestill my heart! 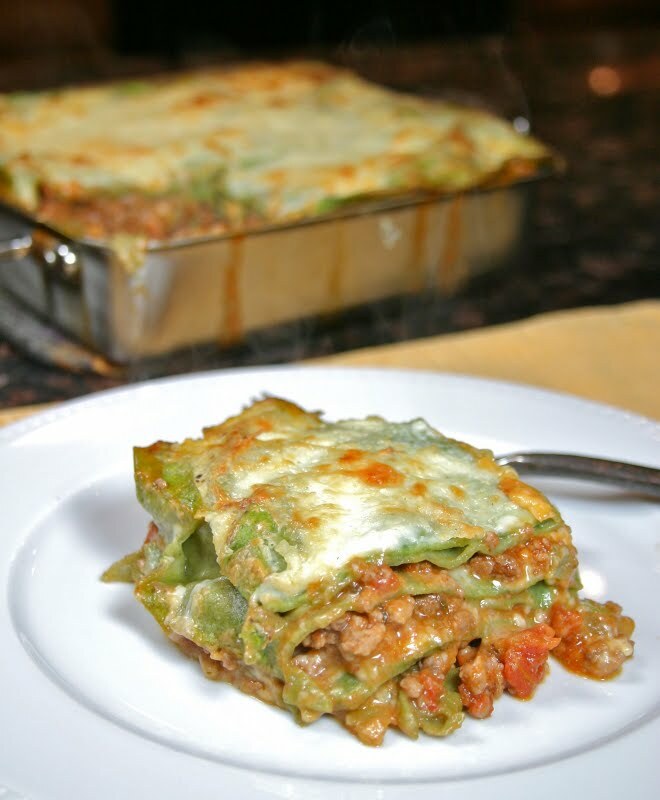 I made a similar lasagna with non-spinach noodles for a large group a while back and it was a huge hit. This looks utterly gorgeous and I fully intend to try it out on my next big gaggle of guests! As usual, your dish looks perfect! This was a great challenge. I enjoyed seeing your finished product. Your lasagna looks so delicious. Thanks for the tip about the foil. ok - i woke up. it was just a fantasy dream. Mmm, your lasagne looks amazing!! I love your pictures =D. You Daring Bakers went all out with this one! It's fun to see everyone's recipe. Yours looks great! Elaine, I want your Kitchen Aid, and a huge piece of that scrumptious looking lasagna! Your lasagne looks awesome! Gorgeous shots! I'm ready to dig into your lasagna. Your photos are really beautiful. 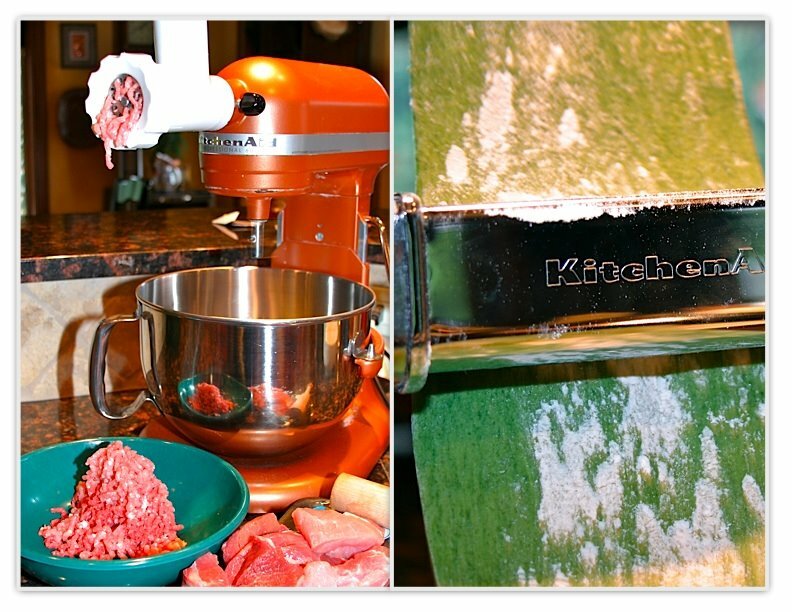 I have one of those grinders for my kitchenaid too and use it for grinding my own meat. I will definitely try this recipe. Yours came out soo great. Laura: Do the spinach this time- it makes the noodles special! Michelle: :-( Make a mini lasagna just for you! Food Hunter: I love that foil! Doesn't stick to a darn thing! Karen: I love looking at everyone's DB challenges! Proud: Get a KA, woman! In my family, this is the only way to make lasagna. My nonna grew up near Modena, and this is one of my favorite dishes that she passed down to us. Good job! This looks delicious and I really want to try it, but I don't eat pork. Is it OK to use all beef? If I do, are there any extra ingredients I should add? Brianna: You can certainly use all beef. The pork adds a sweetness to the mixture, but if you don't have to use it. And nothing else would change in the recipe, just substitute more beef for the pork. You could also use ground veal in place of some of the beef, if you like. This was DELICIOUS!!! A bit labor intensive but worth every second - my family ate the entire dish, even my hubby who normally does not like lasagna! Thank you for your recipe along w/ great photos! I love this Lasanga it's really good I was'nt sure how it was going to taste wothout the ricotta and mazarella . It was a hit at my house. My daughter is having a baptizmal for my grandson and she wants to serve Lasanga I will definetly be shareing this recipe with her. Thank you!! Can you assemble this a day ahead of time and then cook it in the oven the next day? Of perhaps make the pasta the day before and assemble and cook the next day? Oh My Goodness! I just made this and it is amazing. Absolutely the best lasagna I have ever had. Thanks for the great directions and helping me feel brave enough to make my own pasta. This may take some time to make but it's totally worth it! Thank you!! I had lasagna in Dallas with the same ingredients but they added moze fella and fontina cheese. Would that be alright to use with your recipe and have you ever died this? Hello I was wondering can I make it the night before as I will be making the white lasagna and the eggplant and this meat one too.